What they do: The Food Chain Workers Alliance believes in a truly sustainable food system, one that can provide healthy and locally made food, and that has the potential to lift up communities, workers, and our shared environment. It is a coalition of worker-based organizations across the country whose members plant, harvest, process, pack, transport, prepare, serve, and sell food, and who have organized to improve wages and working conditions for all workers along the food chain. Click here to view a list of the Alliance’s members. As a country-wide alliance, they have the ability to make changes on the local, state and national level. Currently, the group has 31 members representing more than 350,000 food workers in the US and Canada. 1. Growth & Learning: Worker solidarity and leadership among workers all along the food chain is key to making improvements in the workplace. This committee plans the Alliance’s annual worker leaders summit as well as the regional Justice in the Food Chain training series, and develops other ways that members can learn from each other. The annual worker leaders summit is a powerful opportunity for workers in all sectors of the food chain, from around the U.S. and Canada, to come together to share their stories and experiences, learn from other’s campaigns and gain new skills. Participants in the Justice in the Food Chain training series share concrete skills in organizing, coalition-building, and campaign strategy development. The training sessions are held regionally, three times a year. 2. Campaigns & Messages: This committee helps to build public support for members’ organizing campaigns and the principal campaign of the Alliance, which is focused on the Good Food Purchasing Program and develops messaging, materials, and social media tools to support those campaigns. The Good Food Purchasing Campaign encourages large institutions to direct their buying power toward five core values – local economies, environmental sustainability, valued workforce, animal welfare and nutrition – using the Good Food Purchasing Program to guide their efforts. The Program provides a flexible framework to support cities in creating benchmarks for procurement around these five values. In many cases, the goals they set build on existing local momentum in order to expand good food in the region by working in tandem with ongoing efforts. Recently, Chicago committed to the Good Food Purchasing Program. 3. Movement Building: The Alliance believes that to achieve their vision of a sustainable food system they need to build broad and deep social movements, and that they can’t do this alone. They therefore have co-founded and play leadership roles in a number of national groups including the HEAL (Health Environment Agriculture and Labor) Alliance and the Domestic Fair Trade Association. The HEAL (Health Environment Agriculture and Labor) Alliance brings together workers from various sectors of food and agriculture with agricultural policy experts and community organizers and activists. The Alliance is a co-founder of HEAL and serves on its steering committee. The Domestic Fair Trade Association holds up principles of social justice for trade in the U.S. and Canada, focusing particularly on the agricultural and food systems. The Alliance is a member in the NGO (non-government organization) sector. Other membership sectors include farmworker groups, manufacturers/processors, retail coops, and farmers. Mission: to build a more sustainable food system based on the principles of social, environmental and racial justice, that respects workers’ rights and provides everyone with access to healthy and affordable food. 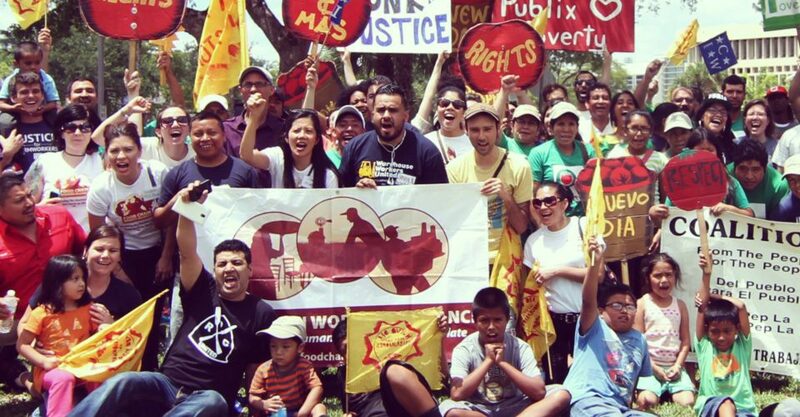 Latest project/campaign: The Food Chain Workers Alliance is expanding its worker leadership development training, Justice in the Food Chain series, to add Level 2 sessions for those who have already attended the training and to train food workers and organizers to lead training sessions in their own communities. Interesting fact about how it is working to positively affect the food system: The Good Food Purchasing Program (GFPP) is nationally regarded as the most comprehensive and metric-based food procurement policy in the country. It provides a way for institutions to work with food service providers, distributors, processors and growers to create a transparent “farm-to-fork” food supply. The Alliance encourages local coalitions around the country to advocate for the adoption of this program in order to bring more good food to low-income communities and strengthen regional Good Food systems. Organic article was removed temporarily to resolve a source credibility issue. Stay Tuned.